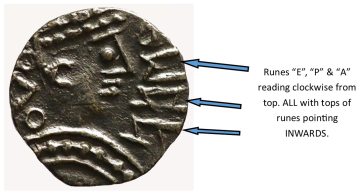 This type has the runes EPA reading in a clockwise direction from the top of the coin downwards, the top of the runes face towards the outside of the flan. It has the rectangular nose/forehead very typical of the R8 series. On many of the specimens the runes have some degree of distortion and are sometimes not properly formed as with the middle rune in the image above. This group has a typical Reverse of a beaded standard of usually between seventeen and twenty-nine beads, this standard contains a central plain annulet. There are two L’s adjacent to each other and two 45° lines adjacent to each other. Each corner has a line pointing out from the corner, mostly from the corner bead, at 45°, the line ending in a pellet. Mid-point along each side is a cross pommée pointing outwards at 90°. I refer to this style as a typical LOLII R8 standard. The artwork frequently extends over the flan edge. 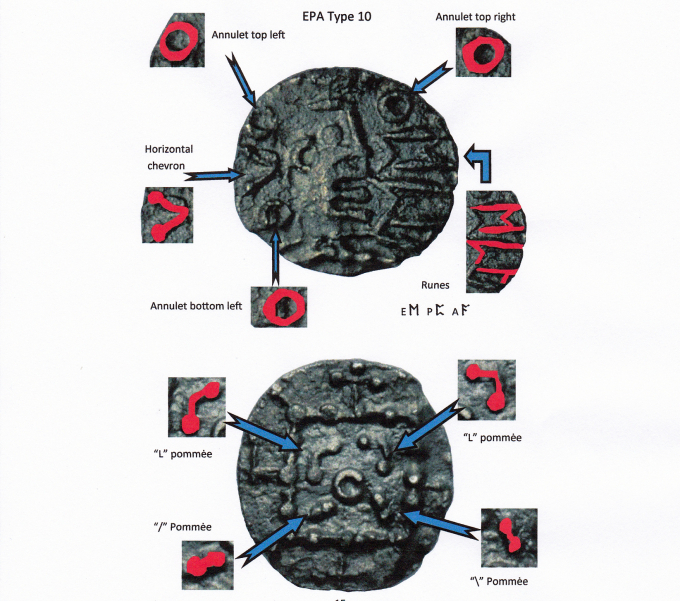 Type Ten consisted of thirteen coins with ID numbers 7,13, 19, 39, 40, 41, 45, 51, 52, 56, 57, 68 and 71. Five coins came from Norfolk, 39 no weight; 40 = 1.15g; 41 = 1.01g; 45 no weight; 56 = 0.99g. Four were of unknown origin, 13 = 1.01g; 19 = 0.65g; 52 = 1.01g and 71 = 0.87g. One was found in Cambridgeshire 51 = 0.68g; one in Suffolk 57 = 0.79g one in Lincolnshire 68 = 0.86g and one in Leicestershire 7 = 1.03g. Average weight of eleven type Ten coins (two no weight given) 0.913g. 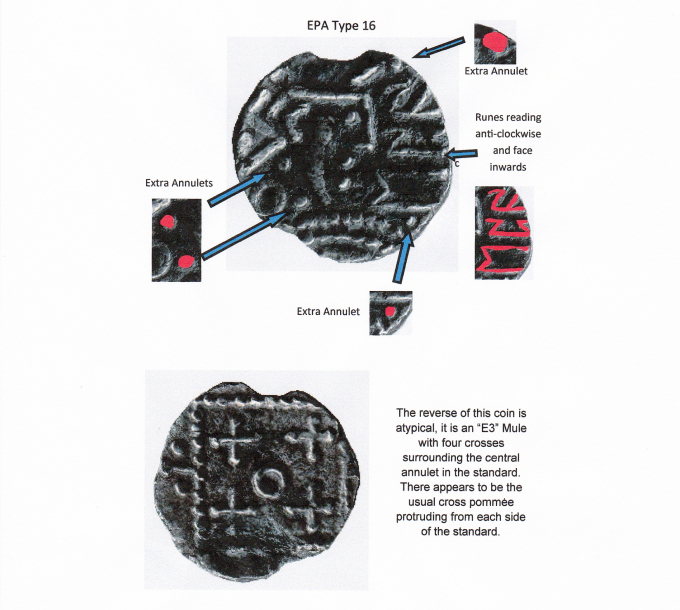 This type has the runes EPA reading in a clockwise direction from the top of the coin downwards, the top of the runes face towards the outside of the flan. It has the rectangular nose/forehead very typical of the R8 series with the exception of a pellet within the horizontal chevron behind the head. The reverse is a typical LOLII with the exception of a Tufa or Fantail on top of the standard not the usual cross. 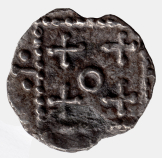 The one coin in this type, ID 11, was found in Suffolk and weighed 0.94g. Image only shows position of Runes. See image number 1999.0108 Early Medieval Corpus on-line database at the Fitzwilliam Museum Cambridge. This type has the runes EPA reading in a clockwise direction, the top of the runes face to the outside of the flan. It has a pointed nose un-typical of the R8. The three-pointed crown on the head is fully visible. The reverse is a typical LOLII. 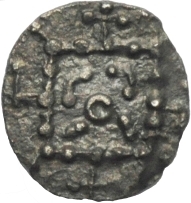 The one coin in this type, ID 38, with no find spot available weighed 0.95g. Image only shows position of Runes. See image number 1993.9415 Early Medieval Corpus on-line database at the Fitzwilliam Museum Cambridge. This type has the runes facing part inwards and part outwards. The E rune is facing inwards and the A facing outwards. The nose on the obverse is pointed. The reverse has a typical LOLII configuration. 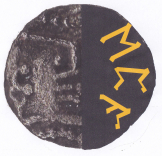 The one coin, ID 33, was found in Leicestershire and weighed 1.13g. A further coin of this variety has recently been observed . This is only the second example of this type I have seen.The Obverse was very similar to 662 above and could be a Die match but the Reverse (a usual configuration of symbols) was quite different. The coin was found at Boston in Lincolnshire, it was not included in the initial survey. 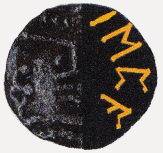 This Type has the runes facing inwards, top of M facing into the centre of the coin with the runes being anti-clockwise. It is very uncommon to see runes written like this in the R8 series. It has a slightly pointed nose on the face. 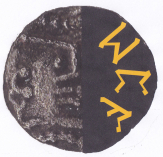 The one coin in this class ID 69 was found in Norfolk and weighed 0.62g. Metcalf has classified the coin as a "Contemporary Copy", an R8/E3 "mule". The reverse belongs to a Porcupine of variety F. Metcalf & Op den Velde 2009-10 cat no 3228-3436. I have purchased another coin of Type 16. This is only the second coin of this type that I have ever seen. Below is a picture of the coin. I have not been able to register this coin with the EMC as the Find Spot is unknown. The Obverse shows the remarkable similarity between both the runes and symbols behind the head. Is this a die match? The Reverse has very similar "unbarred" crosses outside the Standard. The Standard is offset to one side. This coin was not included in the original survey. 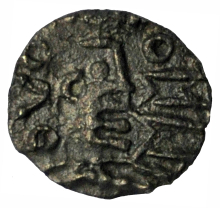 The obverse of this type has an unidentified rune in front of the ‘E’. The runes are read clockwise and face outwards. The nose is of the more usual rectangular shape. On the reverse the standard has annulets in place of crosses on each of the four sides. There is a pellet on each side of the annulets. 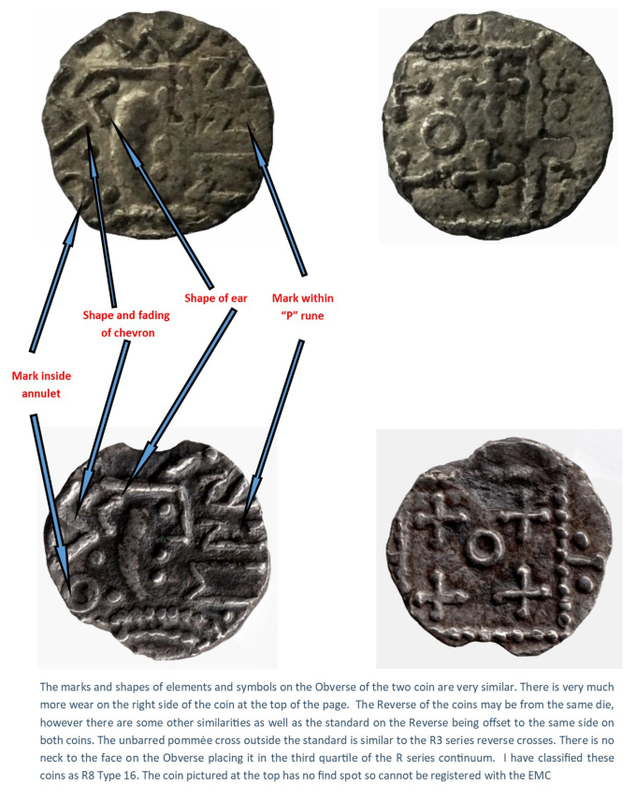 Of the two coins in this type, one ID 21 was found in Suffolk and weighed 0.67g and the other find spot was not known, ID 22, weighed 0.75g. 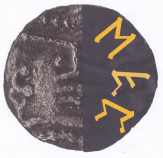 This coin appears to have the unusual runic combination of EAP reading in a clockwise direction, they are facing part inwards and part outwards. The E faces outwards and the A faces inwards. The head/nose is rectangular in shape. The standard on the reverse contains two L’s, one angled line and one T on its side surrounding the central annulet. 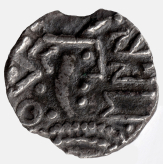 This single coin, ID 25, came from Suffolk and weighed 0.72g.